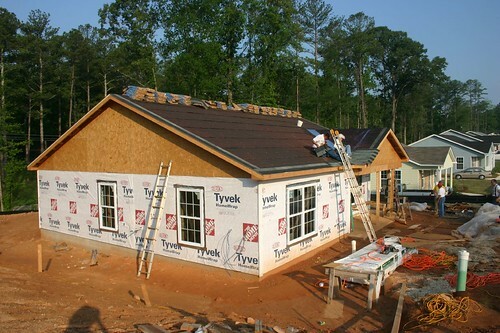 This is the fourth part of a multi-part outline of what is involved in buildings a Habitat house. This article covers the steps in installing roofing – felt and shingles and a few other roof line details such as building a “bird box”, installing the drip edge and vents. The first part is Habitat Tutorial – Prepration for Build which covers some of the pre-build steps the Site Project Manger (SPM) and selected volunteers go though just to get ready for the volunteers, the second is Habitat Tutorial – Part 2 which covers the first day where the walls go up and the third is Habitat Tutoial – Part 3 which covers raising the roof structure. 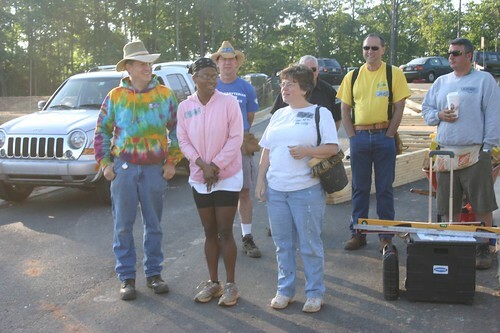 In addition, there are four sets of pictures with slide shows that have already been published that you may be interested in as they concentrate on people on the job site – volunteers. The first is Habitat for Humanity – 2008 Dinner on the Slab consisting of 25 pictures including our future homeowner Nicole Combs and her son Elijah. The second includes 115 pictures of the first day of the build – Habitat Build 2008 – First Day – Walls Go UP . The third is: Habitat Build 2008 Second Day – Roof Goes On which has pictures and blog on the installation of the roof trusses and decking the roof. 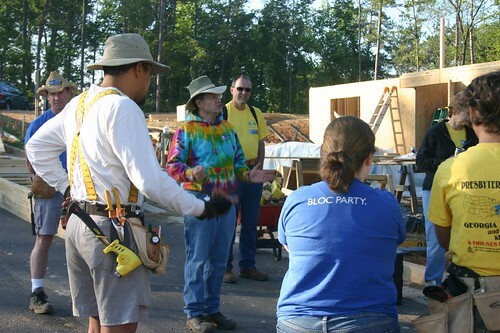 The fourth is Habitat Build 2008 – roofing and siding. If you want access to any of the tutorial pictures they are all in one place for all the tutorials to date. Tutorial Slide Show – 146 pictures so far, including many not in this article. This is the way Habitat volunteers see the house when they arrive on the scene on roofing day. Soon the roof will be covered front and back with volunteers. It is essential that the roofing be done early in the day and that there is plenty of water available. The felt and starter shingles are already in place. We need to start this tutorial a little earlier than that. 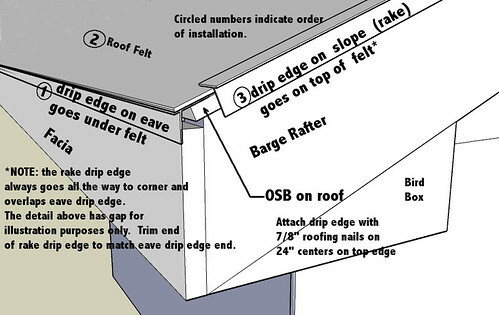 This drawing illustrates drip edge installation. The drip edge must be installed in the order shown. The drip edge is a metal extrusion that goes along the horizontal edge (eave) of the roof under the roofing felt and along the sloping edge (rake) of the roof above the felt. Install the drip edge for the eave before the roofing felt is installed. Install the drip edge for the rake after the roofing felt is installed. Attach the edge using 7/8 ” roofing nails on 24″ centers. Unlike shown in the drawing, the rake edge goes all the way down and overlaps the eave edge. Trim the rake edge to match the eave using tin snips. When two pieces of drip edge meet in a joint, overlap the joint by 1 to 2 inches by trimming the top of one as needed to allow them to overlap. Joints on the rake drip edge should should have the upper one overlapping the lower one. Also shown in this illustration is something called the “bird box”.